January 7th is my Siberian husky’s [44th] birthday. Tess was born January 7th, 1975. Thanks to her hyper-social demeanor and my inability to deal with it, Tess pulled me into my career as a dog trainer. Despite my growing dislike for Tess, I enrolled at K-9 OTC in Menomonee Falls, Wisconsin. After attending classes for three months with pathetic results, I made a crazy decision — I decided to practice! After two weeks my outlook changed; Tess started listening and by spring of ’76 I had become an obedience trial enthusiast. Ultimately, Tess won multiple Highest Scoring Dog in Trial awards and completed her Utility Dog title in the United States in 7 shows and her Canadian UD in 3 shows*. Tess died 32 years ago. When I got Tess in 1975, I just wanted Tess to listen. Thank goodness she didn’t! The struggle forced me to learn how to communicate with Tess and develop a profound bond that is only experienced by working through challenges. Every dog I’ve owned has shaped and enriched my life but Tess made the greatest impact. Happy birthday Tess! *Thanks to Art Kearns at Arko Dog Training, Milwaukee, WI and Bill Koehler, Ontario, CA for the step-by-step instruction that simplified my Siberian husky training program. 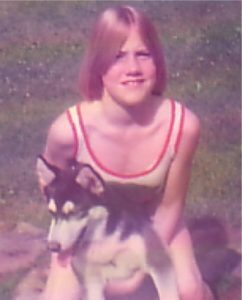 I LOVED Tess, my first husky. It was May of 1975, I was in fifth grade, and hated to get on the bus to leave Tess. But, by June, things changed; the honeymoon was over** and I was exasperated by Tess’s bad behavior and lack of listening skills. Turns out, Tess was one of the 84% of dogs that can be great or horrible depending on who is on the other end of the leash. Fortunately (thanks to the patience and encouragement of Barb Maxwell, my infinitely kind and wise neighbor), I discovered Tess’s behavior deficiencies were entirely my doing. **I now know this is actually typical. New dogs tend to behave well and are most responsive in the first 30 days but, if not given proper direction, good manners nose dive.